This feature allows you to concentrate on a certain area of your Mind Map - it is particularly useful if your Mind Map is very large or if you want to draw attention to a a certain section of your work. You can find both the 'Focus In' and 'Focus Out' buttons on the main toolbar under the View tab. 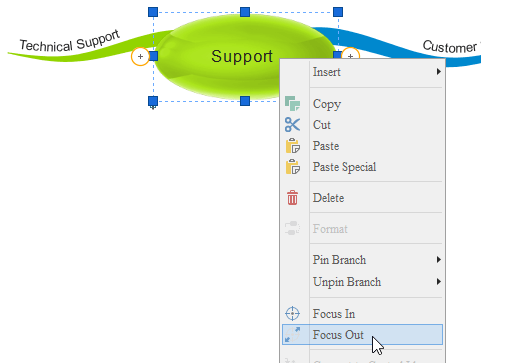 You can also right click on a branch and select 'Focus In' or 'Focus Out' from the View tab on the main toolbar. When focusing on a specific branch you will find that it is transformed into a new Central Idea. Its Child branches will have become Parent branches. The 'Focus In' icon can also be seen in the bottom left corner of the Central Idea. This shows that the 'Focus In' feature has been used. You can continue to focus in on any of these branches. 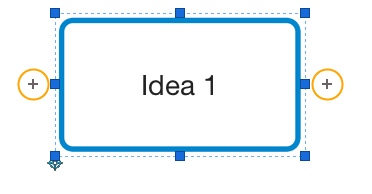 For example, if you want to develop a certain branch with further ideas you can simply repeat the process of selecting the 'Focus In' feature. This will turn the branch you are interested in into another Central Idea. Select 'Focus Out' from the View tab on the main toolbar. Alternatively, you can also right click on your Central Idea and select 'Focus Out'. This will bring you back out to the main Mind Map that you started with. This feature allows you to concentrate on a certain area of your Mind Map - it is particularly useful if your Mind Map is very large or if you want to draw attention to a certain section of your work. You can find both the 'Focus In' and 'Focus Out' buttons on the main toolbar under the View tab. 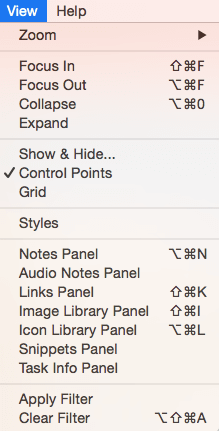 You can also right click on a branch and select 'Focus In' or 'Focus Out' from the menu.